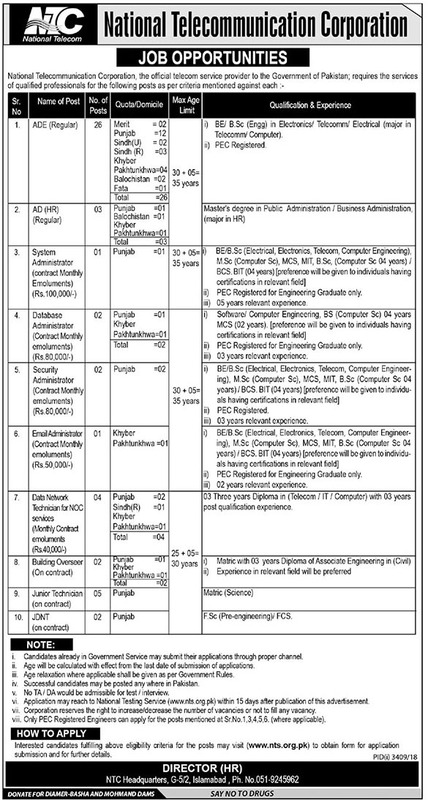 The government of Pakistan has announced new jobs in the National Telecommunication Corporation.NTC Jobs 2019. Forty-five jobs have been announced by the National Telecommunication Corporation in which all Pakistanis are eligible to apply. Punjab, Sindh, Khyber Pakhtunkhwa, and Balochistan can apply for the job of NTC. National Telecommunication Corporation, the official telecom provider to the government of Pakistan requires the services of qualified professionals for the following posts as per criteria mentioned. The National Telecommunication Corporation (NTC) is a government-owned information technology and Telecommunication services provider corporation in Pakistan. Many good jobs have been announced by the government, you can apply and girls can also apply. If you have any questions, you can make comments regarding the job. F.Sc pre-engineering and Matric with Science. You must be at least 30 years old Plus 5 year to apply for NTC Jobs 2019. In this job, you can apply through NTS to download the application form click on the link below.